Rich in protein and edible oil, groundnut is central to the financial and nutritional well-being of hundreds of millions of farmers and consumers across the semi-arid tropics. Besides protein and oil, groundnut seeds are rich source of mineral, vitamins and dietary fiber. 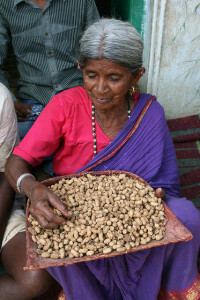 The groundnut haulms are used as fodder for the animals. Groundnut is currently grown on about 21.8 million hectares worldwide. Global production totaled 38.6 million tons, 95 percent of which occurred in developing countries (FAO 2011). Major producers include China, India, Nigeria, USA, and Myanmar. However, the production is concentrated in Asia (50% global area and 68% global production) and Africa (46% global area and 24% of global production). In India, it is grown largely (83 % of total groundnut area) under rainfed conditions during the main rainy season and the remaining 17 % is irrigated mainly in the postrainy season. While India has the largest area under groundnut (6.36 million ha) in the world, its production (6.5 million tons) and productivity (1,022 kg ha−1) have remained low; the latter being well below the world average (Birthal et al. 2010). In West Africa, although Nigeria and Senegal are the largest producers of groundnut, Mali and Niger are also important groundnut producers. In Mali groundnut is grown on 0.29 million ha with an average production and productivity of 0.26 million tones and 880 kg ha−1, respectively. In Niger, groundnut is grown on a larger area (0.44 million ha) than in Mali, but with greater fluctuation in production due to variable climate. Average production and productivity of groundnut in Niger is 0.21 million tons and 480 kg ha−1 (mean of 2001 to 2010 production data reported in FAO 2012). There are many region-specific abiotic and biotic stresses that limit groundnut productivity in Asia and Africa. The major diseases are early and late leaf spot, rust and bacterial wilt. The crop is highly susceptible to aflatoxin caused by a fungus Aspergillus flavus. Aflatoxin is extremely hazardous to human health and is especially harmful to the physical and mental development of young children. Other major biotic stresses are sucking insect pests (aphids, thrips and jassids) and foliar feeding insect pests (groundnut leaf miner, red hairy caterpillar and pod borers). Major abiotic stresses and drought, high temperatures and soil nutrient deficiencies. Temperature regimes of these regions during the groundnut growing period are already close to or above the upper limit of the optimum temperature range (20–30 °C) required for groundnut. Increasing temperatures with projected climate change will affect growth and development of crops, thus influencing potential yields. A critical variable is the number of days a crop is exposed to supra-optimal temperatures at critical growth stages, i.e., flowering, pollination or grain filling (Prasad et al. 2003). In the SAT regions, the changes in rainfall coupled with rise in temperature may reduce the length of growing period and intensify droughts. Therefore, it will be important to breed drought tolerant cultivars and to match their maturity durations to the period of soil water availability for higher and stable yields.